The Alexa Skills Kit provides a library of built-in intents. You can use these intents to add functionality to your skill without providing any sample utterances. See Interaction Model Schema for the complete intent schema compatible with the developer console and the Skill Management API. AMAZON: all built-in intents begin with the AMAZON namespace. SearchAction: an action that identifies the action the user wants Alexa to take, such as searching for information. object: a property of SearchAction, for identifying the entity on which it should operate. 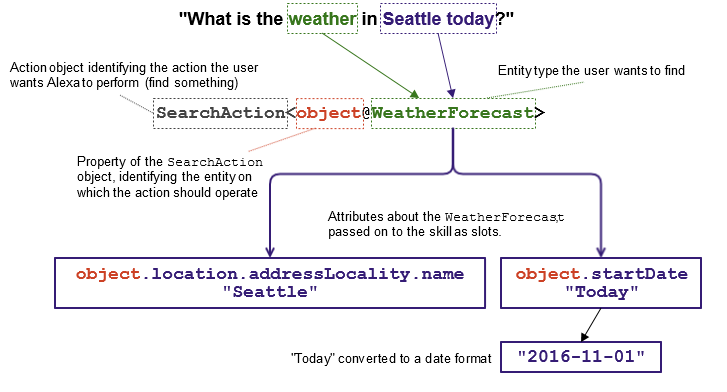 WeatherForecast: the entity type for object. This identifies the entity the user wants to search for. [temperature]: (optional) if included, specifies an attribute to narrow the scope of the intent. This creates an intent that is triggered when the utterance mentions the specified attribute. For instance, the intent AMAZON.SearchAction<object@WeatherForecast[temperature]> would be triggered by "what's today's temperature," but not the more generic "what's the weather today." The following diagram illustrates how an utterance like "what's the weather in Seattle today" is translated into this intent and passed along to your skill. Note: Slots (such as object.location.addressLocality.name and object.startDate shown in the diagram) are generated from the intent signature automatically. You do not include any slots in your intent schema. For more about the naming structure for the built-in intents, see Understanding the Structure of the Built-in Intent Library. Note that the standard built-in intents, for actions such as "stop" and "help" do not use the structure described above. See Standard Built-in Intents for details. The built-in intent library is organized in the categories listed below. Each category contains a set of relevant entity types. Use the links to the entity types to see the available intents. Tip: You can use intents from different categories in the same skill. The categories are provided to help you find the intents, not dictate how you use them. In the developer console, you can search for built-in intents on the Build page. Navigate to Custom > Interaction Model > Intents, add a new intent, and select the Use an existing intent from Alexa's built-in library option. Intents asking about books and other written works, such as rating books, adding books to reading lists, or navigating through audio books. Intents for asking about calendars and schedules, such as asking about upcoming events, adding events to a calendar, and looking up events such as birthdays. Intents for asking about show times and events at movie theaters. Intents for other requests that don't fall into any of the more specific categories. Intents for asking about local businesses and locations, such as operating hours, phone numbers, and travel times to locations and businesses. For example, users can ask when a particular business is open, or ask for the phone number of a business. Intents for asking about music, such as asking about songs, playlists, and music libraries. Intents for asking about television and other types of video media. For example, users can ask for information about episodes of a TV show. Intents for requesting weather reports and forecasts. Intents for general actions such as stopping, canceling, and asking for help. Unlike all of the other built-in intents in the library, these intents do not have a signature derived from actions, entity types, and properties. These intents cannot use slots. You cannot include more than 10 of the built-in intents in a single interaction model. You cannot define an interaction model that has no sample utterances. Include at least one custom intent with utterances in your interaction model. Available: The intents are fully available and not considered a preview. A book. These intents let users ask for actions related to books, such as finding books, adding books to reading lists, and rating books. A section or part of a creative work, such as a page or chapter. These intents let users specify a particular part of a book, movie, page, or other section. A calendar that contains a list of events. These intents let users make requests related to calendars, such as reading back events, looking up events, and adding items to a calendar. A screening of a movie or other video. These intents let users make requests related to particular screening events, such as asking for the show time for an event, asking what movies are playing, and asking what movie theaters are playing a particular movie. A generic object. These intents let users make requests that are not related to any specific object or entity, such as requests to pause or continue an action. A collection or library offered and curated by an organization or collected and organized by an individual. These intents let users ask about collections of books or music. The broad category of creative works that are musical in nature, includes songs, albums, playlists, and other items. These intents let users request actions related to musical works, such as adding songs to a library, controlling playback of musical works, and looking up information about musical works. A musical group, such as a band, an orchestra, or a choir. This can also represent a solo musician. These intents let users request actions related to a music group, such as "liking" a group, finding songs by a group, or asking about the members of a group. A music recording (track), usually a single song. These intents let users ask for specific information about songs, such as the artist who performs the song, the genre of the song, or other information. A person or group that performs music. These intents let users request actions related to musicians, such as asking to rate or "like" a musician. A person who sings, either as a solo performer or as part of a group. These intents let users request actions related to singers, such as asking who sings a particular song. An episode for TV, radio, video game, or other media which can be part of a series or season. These intents let users request actions related to episodes, such as starting playback of a particular episode or searching for a particular episode. Season during which a series of related episodes are broadcast on TV broadcast or delivered online. These intents let users request actions for a TV season, such asking to start playback of a particular season for a show. A creative work that includes video and possibly audio, such as movies, television shows, and video clips. These intents let users request actions related to video works, such as adding videos to a library or watchlist, controlling playback of videos, and looking up information about video works. A weather forecast. These intents let users ask for general weather forecasts, as well as more specific questions about specific weather conditions. The standard intents are used for common, general actions such as stopping, canceling, asking for help, and navigating screen-based content. Unlike all of the other built-in intents in the library, these intents do not have a signature derived from actions, entity types, and properties. These intents have names such as AMAZON.HelpIntent, AMAZON.StopIntent, AMAZON.CancelIntent, and AMAZON.PreviousIntent. Note: The standard intents cannot use slots. For the full list, see Standard Built-in Intents.